22 Feb 2010 | Author: David J. A couple of new projects launched last week, giving people a whole new way to get into fashion. Esquire Magazine is using ScanLife as part of their “Esquire Collection” which details the essential wardrobe that every guy should have. 25 codes are connected to each individual item throughout the layout which gives readers a menu of options in one-click. Each code links to a menu of options , that could include an option purchase the item, get more information on how to wear it, or just subscribe to the magazine. We are already seeing hundreds of scans per day and many more applications are in the works. Norma Kamali, the famed fashion designer known for constant innovation, has hit another first in the industry. To help launch her new lines during Fashion Week in NYC, she has placed 2D codes throughout her store on off 5th Avenue. Code show videos, or an option to purchase/ship the item, or even offer chances to win the merchandise through a Lotto code. 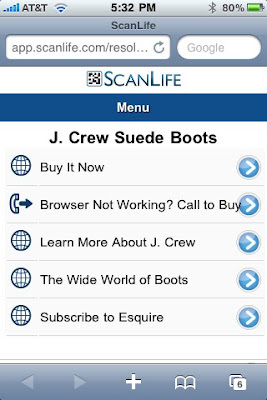 One Response for "ScanLife Gets Fashionable"